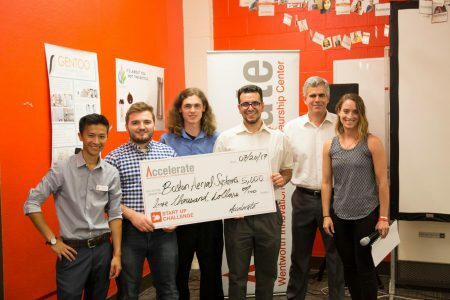 BOSTON – The crowd was large, the air was cool, and student teams came prepared to pitch their hearts out on July 20th at Accelerate’s Willson Hall location. The night featured five teams made up of students from almost every major including Business Management, Computer Science, and Biomedical Engineering. Judges for the night featured a diverse panel that included Tess Bailie, a UX Engineer and Product Manager from Draper; Leo Downing, a Registered Investment Advisor from MSW Financial Partners; Paul Karsinski, founder of Epicenter Experience; and Rachel Nicoll, Innovative Program Manager at MassTLC. Every team had 5 minutes to wow the judges and the crowd, with an additional 5 minutes for judges’ questions and answers from the teams. Once all the teams had pitched, the judges took almost an hour for deliberation as to which teams would be funded that night. As they revealed the results, the judges also took time to share their advice and their feedback about each team’s business. 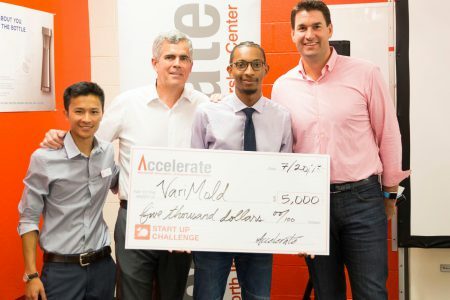 Only one team was not funded that night, but Accelerate’s Andy Cahill told the crowd not to dismay. “Don’t let one night slow you down and don’t let it tell you it’s all okay”. CSB pitched their previously funded idea to make building and registering for classes simpler and streamlined. The team, made up of Jordan Carter (BSCO’ 17), Jake Harrington (BCOS ’17), Jeffrey Huey (BSM’ 17), Dominic Laudate (BCOS ‘17), and Kenny Whitman (BCOS ’17), researched Wentworth system of registration and in the future hope to be able to partner with 3 or 4 large local universities as well. The judges gave the team a tough critique wondering who in their customer base would actually be paying for the service and then how long would it take the team to return a profit. In the end the judges decided not to fund the team but instead encouraged them to find a way to improve their business model. Formerly known as Alpha Industries, Boston Aerial Systems came back this Pitch Round with a solution that could save amateur drone flyers tons of money – a modular drone which will break apart on high impact and parts can easily be put back together or replaced without having to drop even more money on a new drone. Teammate Josh Willis (BSEN ’17) pitched for the team, showcasing some of the problems with dropping $1,200 on a new drone and then crashing it within minutes of flying because of inexperience using them. James Boyle (BSME ’17), Ryan Cataldo (BSME ’17), Greg Frasco (BCOS ’16), and Joe Gilardi (BSEN ’17), also look forward to continuing iterations of the drone. 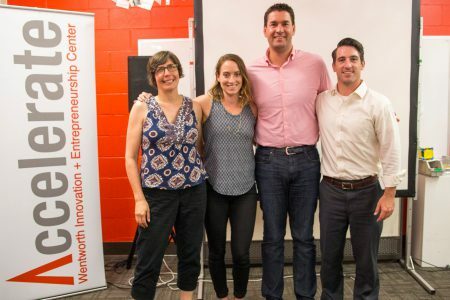 Impressed by the idea and cost savings, judges also wanted to the team to really look into applying their prototype to other applications because as Judge Tess Bailie noted, being able to put broken things back together and have them function is very valuable. 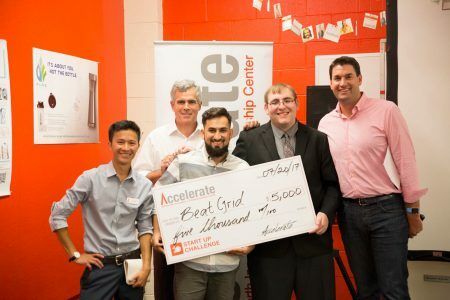 Returning for the third time, Maarouf Barry (BSM ’19) presented for his team seeking funding for another, larger, prototype. Their modular concrete casting machine aims to make it easier for architects to design and contractors to install complex shapes and curves on buildings. 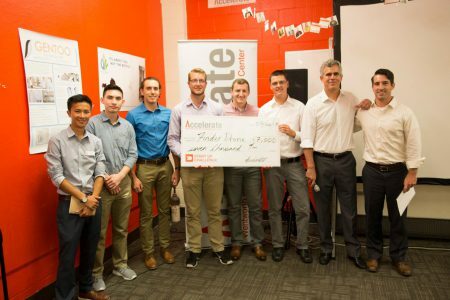 An interesting idea the judges thought, but they were concerned with scalability and really wanted the team, Maarouf; Christopher Brolly (BSAM ’20); CJ Favazza (BSME’17); Julio Figueroa (BCOS ’20) to continue their business and dig deep into their end user experience. Derek Chaplin (BCOS ’17), Walker Zack Mason (BCOS ’17), Diego Prates (BCOS ’17), Jordan Williams (BELM ’18) are a team that wants to make rhythms and beats through an interactive game which uses a button grid to play. It could also be a learning tool as a stepping stone to playing actual instruments much like Guitar Hero has done already. Right now, they are focusing on the EDM genre with the option to expand. As one of the new teams on the block, Finder Drone came strong with their presentation. Their emergency rescue aid drone could for example drop a life vest to someone in the ocean while a lifeguard made their way to the person in need. The team is going to use their funding to iterate their drones and advance their partnership with a town on the cape. By creating prototypes Daniel Carnazza (BBME ’17); Garrett Guilmett (BSME ’18); Taylor Pratt (BSME ’18); and Kenzo Wong (BCOS ’18) can also test out weather conditions like the effect wind speeds, or rain on the drone.